Sign Up Now for an ItAG! ItAGs are an opportunity for educators, parents, and community members to engage as learners and develop as education activists. Register for ItAGs here. Registration is required and free! In between events, individual ItAGs meet weekly (for five, two-hour sessions) to share experiences, respond to readings, exchange ideas, and develop plans of action. All locations TBD - once registered, you will receive location information. This group will focus on developing curriculum specific to the primary grades on the oppressive, patriarchal, and colonized history of the United States. Too often our students read about Christopher Columbus discovering America and the first Thanksgiving without the truth. There is not a lot of curriculum today that reveals what really happened, so this group will focus on developing that curriculum for the primary grades. 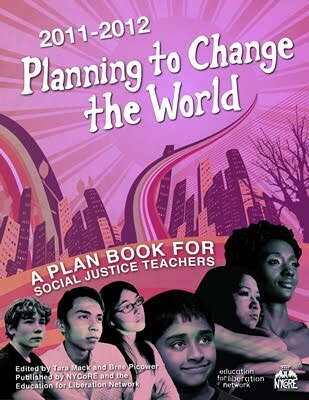 Are you interested in incorporating Social Justice into your math curriculum? During this ITAG we would like to invite educators, parents, students, and community members to collectively participate in the creation of lesson plans that will allow students to read the world through mathematics. We will explore different social justice topics and their mathematical connections to develop lessons to use in different grade levels. In this ItAG we will work together to study culturally relevant science curriculum. We will also explore the NGSS to see what role they can/should play in culturally relevant teaching and learning. Our goal will be to design curricular units for high school science which engage students not only in learning science but also in learning to see their world through more critical eyes. Please spread the word to your educator/student/parent networks and on social media. Support Bronzeville's Struggle for Dyett HS! As many of you know, TSJ is part of the struggle to revitalize Walter Dyett HS, which the Board of Education voted (in 2012) to close by this month (see attached Dyett chronology for more). However, due to sustained community pressure, CPS agreed not to close it and to accept proposals. The Coalition to Revitalize Dyett HS, of which TSJ is a member, submitted one this April (see summary here), as did two other groups. June 17, CPS is holding a "community forum" as part of the proposal process. Below is the info from the Coalition, including its call for a candelight vigil immediate following the hearing. TSJers, wear your TSJ t-shirt (if you have one! ), we want all to see and understand that the support for the Coalition's proposal is from both within and without the community. The effort to reclaim Dyett HS is part of the larger education justice work in Chicago, including the campaign organized by the Grassroots Education Movement (GEM) for an Elected Representative School Board, and for 50 Sustainable Community Schools (click formore info). We are also supporting the CTU's contract demands for "a just Chicago," and were with CTU yesterday, rocking Chicago's downtown, Tuesday June 9! 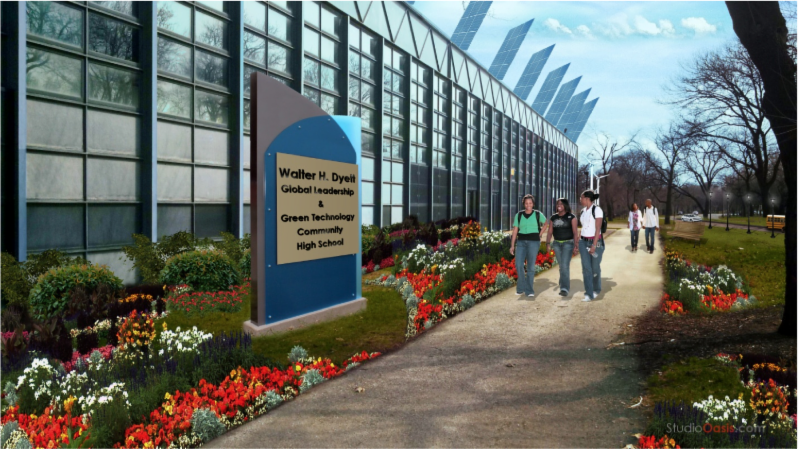 Dyett HS will be one of those 50 sustainable community schools, but it's not won yet. Bronzeville residents worked for over four years to develop a "village" of schools, controlled by the community, but the Mayor, CPS, and allies refused to accept that plan and instead instigated the proposal process. Also, if the Obama Library comes to Washington Park (accelerating Bronzeville gentrification), it will be next door to the HS. At the June 17 CPS-scheduled "community forum," the Coalition and the two other groups will present their plans followed by community testimony. Whether you live in Bronzeville or outside, you can come to the forum, support the community's long-developed plan, and speak out FOR public education and AGAINST education privatization. 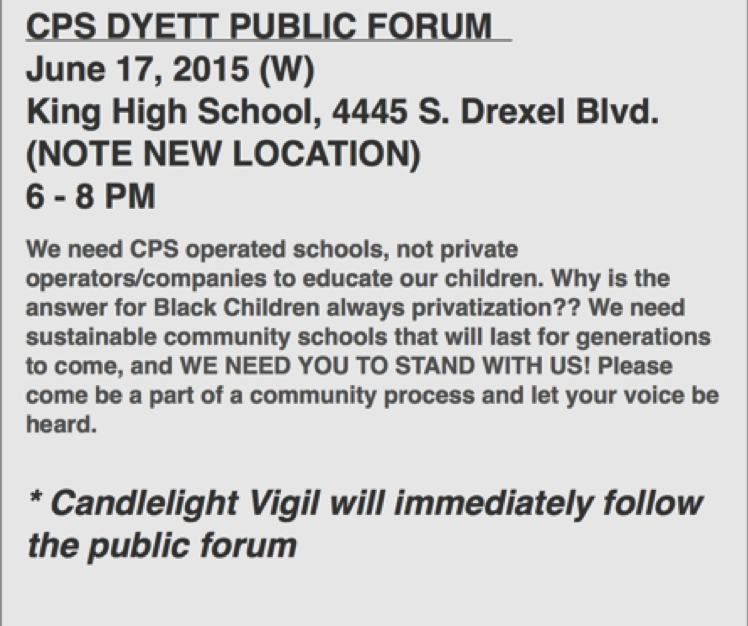 The Coalition is holding a candlelight vigil immediately after the forum, demanding 50 sustainable community schools, of which Dyett will be the first. Clark St. & Randolph St. Stand with our CTU sisters and brothers! TSJers! 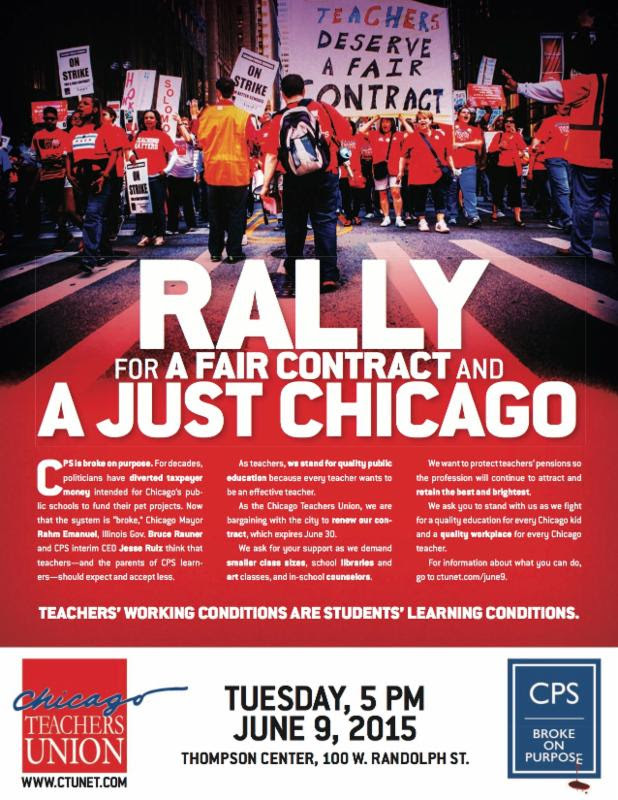 Come out to the rally to support CTU's contract demands (click here), which are demands for a just Chicago and just education for CPS students. Remember-Teachers' working conditions are students' learning conditions. CPS is broke on purpose. For decades, politicians have diverted taxpayer money intended for Chicago's public schools to fund their pet projects. Now that the system is "broke," Chicago Mayor Rahm Emanuel, Illinois Gov. Bruce Rauner and CPS interim CEO Jesse Ruiz think that teachers-and the parents of CPS learners- should expect and accept less. As teachers, we stand for quality public education because every teacher wants to be an effective teacher. As the Chicago Teachers Union, we are bargaining with the city to renew our contract that expires June 30. We ask for your support as we demand smaller class sizes, school libraries and art classes, and in-school counselors. We want to protect teachers' pensions so the profession will continue to attract and retain the best and brightest. We ask you to stand with us as we fight for a quality education for every Chicago kid and a quality workplace for every Chicago teacher.